Iteca Caspian LLC - Important annual Azerbaijan International Tourism and Travel Fair, AITF 2018 starts on 5 April in Baku Expo Center. Important annual Azerbaijan International Tourism and Travel Fair, AITF 2018 starts on 5 April in Baku Expo Center. The 17th exhibition will once again gather representatives of tourism business, national and regional tourism organisations, government structures and media on one platform that reflect the dynamics of incoming and outgoing tourism in the region. As a business tourism hub, the exhibition is the venue for important meetings, signing contracts and announcing new programs and destinations. It is where important meetings are organised, partnership agreements are concluded, and new programs and destinations are announced. In the last few years Mr. Ilham Aliyev, the President of the Republic of Azerbaijan, visits the exhibition and meets with exhibitors. Such attention to the industry and to the exhibition itself from the country’s government gives additional impetus to the development of business relations in the tourism sphere. Since its inception AITF is supported by the Ministry of Culture and Tourism of the Republic of Azerbaijan. The organisers have been providing strong support to the additional business events within the framework of the exhibition. Thus, for the third year in a row, B2B meetings between foreign exhibitors and local travel companies are held as part of AITF. These B2B meetings allow participants to meet not only at the stand, but also to talk with their fellow tour operators face to face and to exchange experiences in specially dedicated areas. This year’s B2B meetings will be held on the 6th of April at Baku Expo Center and will create conditions to establish business contacts with representatives of leading local travel companies, while conducting direct negotiations and expanding the partner base. The exhibition participants also do not miss the opportunity to talk about new destinations and their promotion in the market; the National Tourism Agency of Italy has organised an interesting presentation for representatives of the tourism industry under the name “Italian Kaleidoscope”, while the Czech company “In Travel” will conduct presentation on the resorts of the Czech Republic. Visitors and exhibitors will be able to step back from negotiations and business meetings at the foyer of Baku Expo Center, which will host the Travel Mood Festival during the third exhibition day. Representatives of the participating countries will form part of this event. Here, the central stage will be used by the dancing and music groups from different regions and countries. This festival is an excellent opportunity to get acquainted with the traditions and culture of various countries and regions worldwide. After such a holiday, you will definitely want to visit these countries. Also in the foyer will be organised the stand of the Center for Simplified Support for Family Business (ABAD), where will be presented products of the Center's masters. Also in the foyer you will see unique handmade products of Sandiqca brand. Each product of this brand (accessories, kerchiefs, baskets and much more) reflects the cultural heritage of Azerbaijan. Each year, the exhibition organisers not only improve the business programme and implement new projects, but also create the most favourable conditions for the fruitful work of both participants and visitors. To save time during the registration at Baku Expo Center, all visitors are recommended to benefit from the online registration service using the Fast Track website. Early registration will also allow you to quickly receive a list of participants, information on exhibitions, and a schedule of related business events. Participants will have a free access to the Business and Press Centre, and small cafes and restaurants, including a charging station for mobile phones, will also be available at Baku Expo Center. This year the organisers have started to cooperate with the network of kindergartens Bagcam.az that will create a children's playground at the exhibition, where children can be safely left while parents are busy with visiting the exhibition stands. Children's Playground will be located in the foyer of Baku Expo Center. Here professional educators and teachers from Bagcam.az will take care of your children and will entertain them with educational games, as well as various useful and exciting activities. AITF and HOREX Caucasus are supported by the Ministry of Culture and Tourism of the Republic of Azerbaijan, Azerbaijan Export and Investment Promotion Foundation (AZPROMO) and National Confederation of The Entrepreneurs (Employers) Organizations of Azerbaijan Republic (AEC). The AITF exhibition is also supported by the regular participant Azerbaijan Tourism Association (AZTA) and receives endorsement from international bodies such as the World Tourism Organisation (UNWTO) and the Pacific Asia Travel Association (PATA). 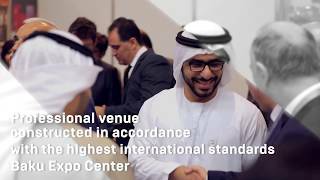 AITF is recognised by UFI (the global association of the exhibition industry). Among Iteca Caspian’s 2018 partners are travel agency Premier Tour; the official hotels “Hyatt Regency” and “Qafqaz Point Hotel”. 5-7 April the exhibition will be open to industry professionals and those in related sectors. Students and children under 16 years old (accompanied by an adult) can attend the exhibition on 7 April.